There are some "larger-than-life" individuals who, if they were characters in a novel or a film, you'd have difficulty believing in them. Graham Ennis is one such person. Probably best known for his numerous contributions to the British version of UFO Magazine (from which the mug-shot on the left is taken), my own first encounter with him took place in April 2000 when he phoned me up at work. This was about a year after I'd finished my secondment to MOD, where I'd been involved, among other things, in monitoring advanced propulsion research. By the time Graham called me I'd moved on to something completely different, but he hadn't known that... which was fortunate for me, because I had the chance to talk to a fascinating individual! Although I'd never heard of him at the time, he mentioned several mutual acquaintances, and he was obviously very knowledgeable on subjects like the Podkletnov gravity-shielding experiment (which was big news at the time, although it's been discredited since then). During that first phone call I wasn't at all sure what Graham's background was -- I thought he might have been a journalist, because he talked about making TV documentaries, but he also talked about a research project he was trying to get funds for at Sussex University... obviously a man of many talents! 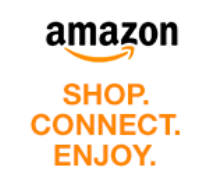 I subsequently found out (from one of the mutual acquaintances he'd mentioned) that he was the director of a small company called Condor Aviation which specialized in advanced aircraft designs such as blended wing-bodies. 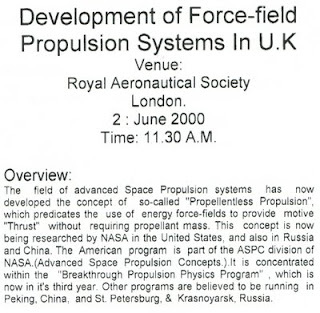 As a result of my chat with Graham, I received a faxed invitation to a meeting he was organizing at the Royal Aeronautical Society on the subject of "Force Field Propulsion" (right). The aim of the meeting was to set up a steering committee that would be the British counterpart to NASA's "Breakthrough Propulsion Physics" initiative. Unfortunately I had to turn him down, for the simple reason that I was no longer working in that area. 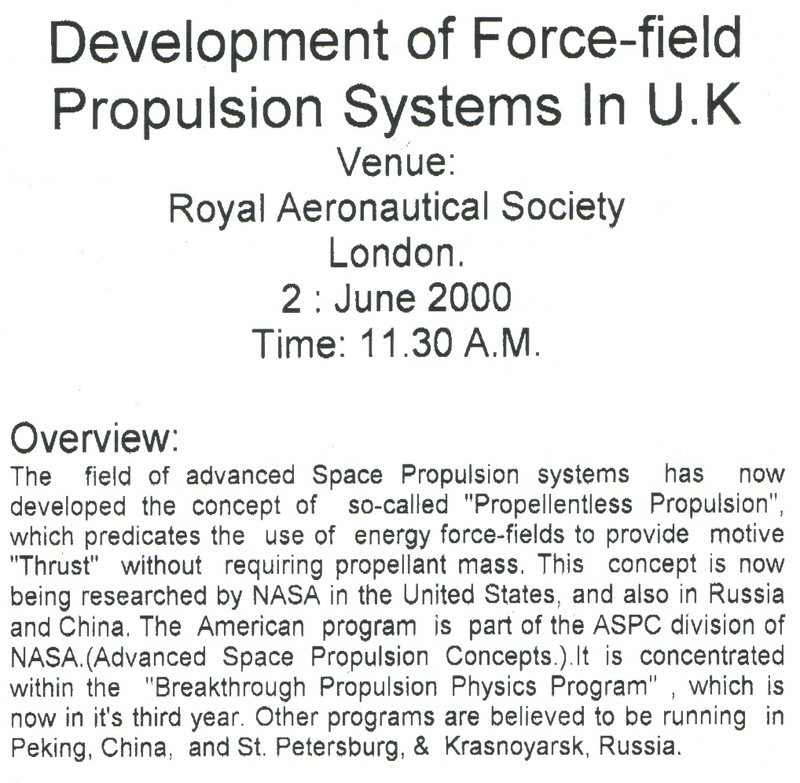 I'm not sure if the meeting ever went ahead (I have a feeling it didn't), but a few months later, in January 2001, Graham organized a much more ambitious gathering along similar lines -- the First International Field Propulsion Conference at the University of Sussex. Again I received an invitation, and again I declined it... a decision I've lived to regret, because by all accounts the event was a massive success (it was even reported in the Guardian newspaper!). However, I've no idea if the proposed steering committee got off the ground, or if Graham's research project ever got funded. Graham's first contributions to UFO Magazine were on the subjects of electro-gravitic research and gravity shielding... not too different from the sort of things he'd talked about on the phone. But his later articles went into completely new territory... predicting worldwide disaster as a result of a shift in the Earth's poles, and/or an environmental catastrophe. In the last few months of the magazine's existence (October 2003 to March 2004) he had a regular "science column", covering subjects like SETI, the Martian meteorite and the Beagle Mars lander. Still not quite clear what Graham's "day job" was, I was interested to see him describe himself in one of his articles as a "sober and serious aerospace scientist"! 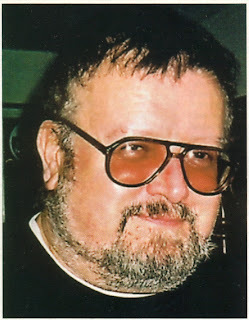 Googling "Graham Ennis" turns up Condor Aviation, the 2001 Field Propulsion Conference and his work for UFO Magazine, but also the interesting snippet that he was a humanitarian aid worker during the Bosnian War (1992-95). These days he is the director of something called the Omega Institute -- apparently an environmental "think-tank" which has developed a number of patents relating to wind turbines. Aid worker, aerospace designer, breakthrough physicist, UFO journalist, environmentalist... as I said, a larger-than-life individual!